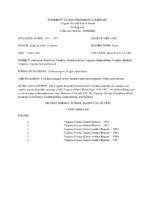 The Virginia Normal School Board Collection includes the minutes and auditor reports from the meetings of the Virginia School Board from 1914–1917. The School Board met at various places throughout the state. Between 1914 and 1917, the Virginia Normal School Board had locations in Farmville, Fredericksburg, Harrisonburg, and Radford. Carbon copies of typed documents.